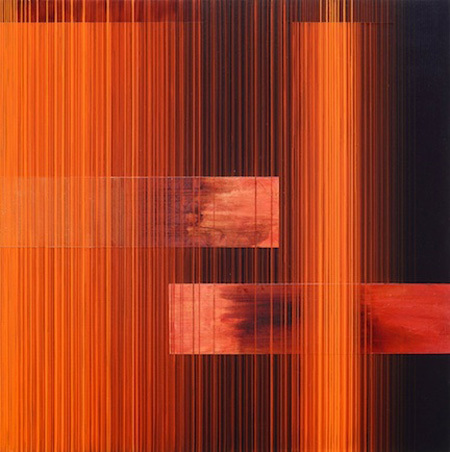 Maggie Tennesen, ''Seismic Activity,'' 2012, acrylic on canvas, 48 x 48''. Art, like life, is a moderated tension between intuition and logic; chaos and control. Four artists, Virginia Katz, Margaret Lazzari, Maggie Lowe Tennesen, and Ruth Trotter make abstract paintings that are steeped in their own personal experience and each also references the natural world. All four have laid down the burden of reaction and inhibition and are deeply engaged with the movement of paint; the immediacy of a mark; and the luminosity of color. A decade ago, Virginia Katz was harnessing the bluster of Santa Ana weather. She recorded the movement of blowing winds by tying pens to eucalyptus branches that created shimmering clouds of delicate scratches on paper. The form of the wind that this recorded was strikingly like that of the Milky Way. With an abiding interest in making visible what is invisible, in particular those forces and processes in nature that change over time to leave (potentially) decipherable patterns, Katz’s work has now taken on a grander perspective of the Earth via paintings and prints informed by satellite imagery. That is not to say that Katz’s work is representational. While the atmospheric mixed media work may loosely resemble painted satellite images, the only things they might truly be said to represent is an accumulation of memories of looking. The mixed media process assures an uncountable number of serendipitous surprises in color, texture, and form. There are moments of representation in Margaret Lazzari’s work, given that she often paints as she gazes towards her exuberant backyard, but there is always a point where the painting separates from the observation and begins to command its own form. "Stepping Lightly," a dozen small panels hung in an offset grid of three rows, captures this relationship between abstraction and representation. The top two rows are airy abstracts filled with smears of pale colors. They don’t resemble the sky so much as moments or movements of light. The emerging lilies in the bottom row are in various stages of blossoming in a dark pond. The mysterious fecundity of the blooming water lilies anchors a visceral response to the experience of growth. Maggie Tennesen’s controlled grids may appear to have the least in common with the expressionistic spirit of the other paintings in the exhibit. Tennesen draws heavily from her Buddhist spirituality and deploys an arsenal of repeating geometric motifs carved into the gessoed canvas before any paint is applied. While each painting begins with a drawing and then a small model painting, it is clear that the actual painting is derived from a mantric meditative space. Each of the paintings is sculpturally constructed with thousands of thin strips of paint which, having been applied with a squirt tube and straight edge, resemble strands of yarn. So much so, that from a certain distance the paintings look like weavings, and from that perspective, convey a duration of process not unlike a woven rug. Her ritualized paint application routine verges on devotional, which in turn produces mandela-like energy fields from her color. In comparison, Ruth Trotter’s exuberant swathes of color look wild, but it is a deliberate and ordered untidiness. Her paintings, heavy with layers of oil and acrylic, also suggest a Freudian cognitive underpinning of drawings and sketches from personal experiences and the collective memory of art history. One symbol, in particular, can be seen in nearly every piece, a bit that was once a drawing on linen of a spotted scarf tied in a knot. That motif is sometimes a collapsing grid, one that is made of soft rumpled fabric; and sometimes a personal possession, painted like a portrait and reemerging, drifting up as from the subconscious. Those residual traces echo into the present, informing and motivating the intuitive choices that produce the foreground and interact with middle- and background. Originally conceived as a counterpoint exhibition that departed from a traditional orientation to art and the gaze, this painting show reveals what four female artists can do who are deeply engaged with the personal, the universal, and a mature non-figurative vocabulary without overlooking the sensual quality of paint itself. Reactionary self-consciousness, the stressful tic of our 20’s, 30’s, and even of our 40’s, is gone. Without forgoing conceptual rigor, Katz, Lazzari, Tennesen, and Trotter have embraced the clash between chance and cognition in the universe of painting to make work that is a pleasure to behold.